Globally, there are no major ABS capacity additions. There are few in china. Overall capacity utilization in the global industry will only grow higher in the medium & long term. Expecting a price rise of 10% as supreme petrochemicals have raised the price of polystyrene by over 10%. 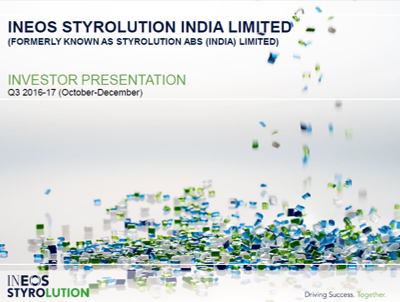 India being a importer of ABS the company expects demand as the per capita income increases. But for January the demand has picked up now the 4 wheeler demand is about 10% while 2 wheeler demand is about -15%.